“Middlesbrough is on the cusp of a major commercial property renaissance, creating a halo effect which will spread across Teesside,” says Stephen Brown, who has worked in the Teesside commercial property market for the past 30 years. “For too long national occupiers have bypassed Middlesbrough, because we did not have the right type of modern properties to attract them. But that’s changing fast and it’s bringing new jobs. “The restaurant destination on Albert Road and Centre Square, the grade A offices in Centre Square, the snow centre at Middlehaven and Teesside Advanced Manufacturing Park will all provide top quality accommodation which national operators demand,” says Brown, whose chartered surveying practice, Dodds Brown – the largest headquartered on Teesside – is advising on all these developments. “The publication of Middlesbrough’s investment prospectus and the political will behind it are helping these developments massively,” says Brown. Turtle Bay’s opening on Albert Road, with Bistrot Pierre launching in September adjacent to the Holiday Inn Express opposite Centre Square, are the latest successes in what Brown believes will be a long line for the town. Brown’s colleague at Dodds Brown, Richard Wilson is the letting agent for the restaurant space. He says: “These new lettings are a real turning point for the town. It is impossible to underestimate the importance of these new brands to the future regeneration of Middlesbrough. The same is true for the new offices planned for Centre Square, as there is no grade A office space currently available in the town. Outside Middlesbrough, there has been a historic lack of quality employment land – but this, too, is changing with the work at Teesside Advanced Manufacturing Park, the former SSI site and developments at key business parks. 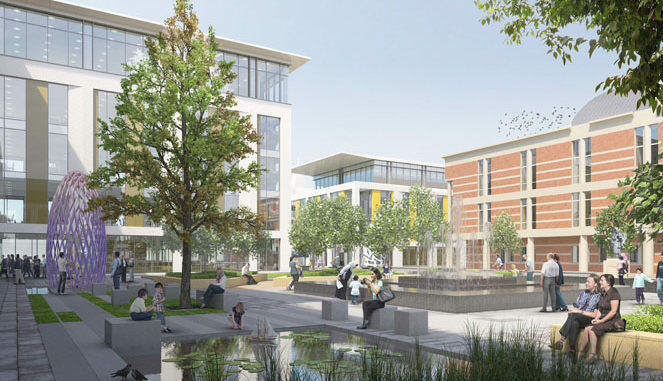 Brown says: “We’ve just secured the largest lettings at the Wilton Centre for the past 10 years, with more than 50,000 sq ft being taken by Faraday Training Group and Fujifilm Diosynth Biotechnologies. Science parks like the Wilton Centre offer a unique mix of office, laboratory and process development space which specialist manufacturers look for. “Despite all the public sector help on offer, larger manufacturers can sometimes struggle to find suitable sites. We are advising a number on their search, as it’s not just a case of searching our extensive database of land and properties, but identifying and assembling potential sites which meet their complex needs. • More details on Dodds Brown’s properties and services are available on www.doddsbrown.co.uk or by calling 01642 244130.